Today I am showing off the new Stylish Christmas. I originally over looked this set at first. It is a new set in the Annual catalog. This stamp set is a Distinktive set . Which means it has a more photographic look to it. 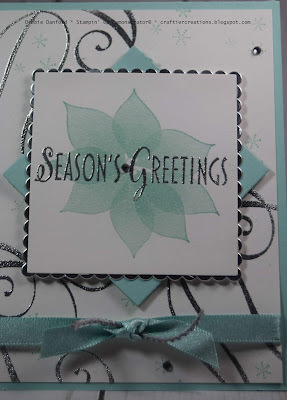 You will need 2 pieces of Shimmery White cardstock. On the 3" x 3" piece stamp the poinsettia in Pool Party. 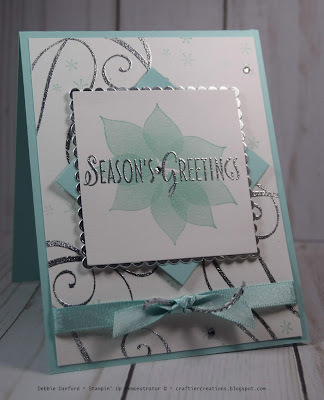 Take your embossing buddy and rub it over the top of both pieces of Shimmery White. 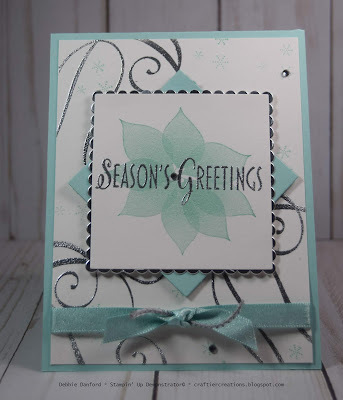 On the 4" x 5 1/ 4" randomly stamp the swirl in Versa Mark and the phrase over the top of the poinsettia you just stamped. 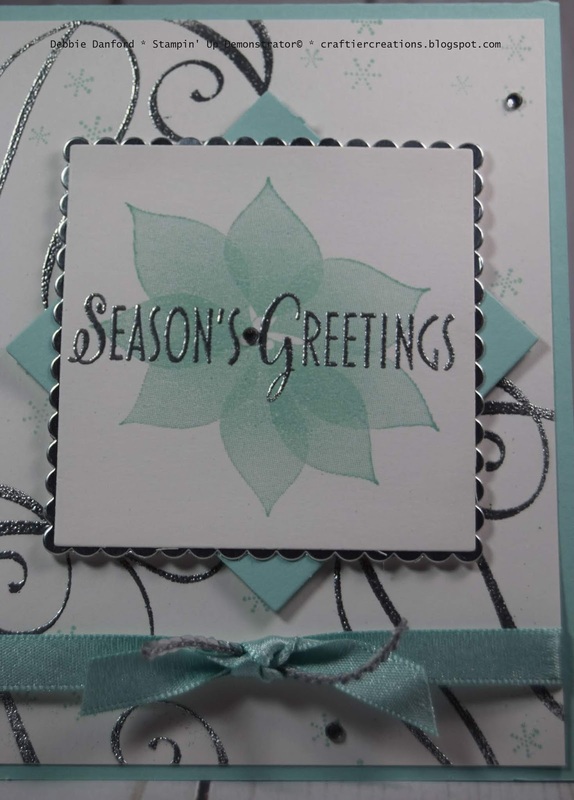 Emboss with Silver Embossing powder. Randomly stamp the snowflakes in Pool Party on the larger piece. 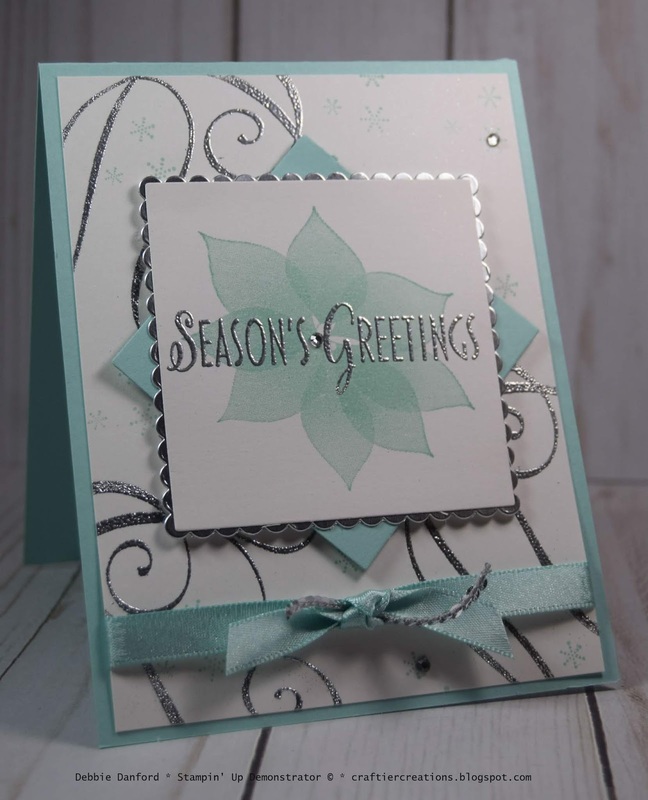 With the Layering Squares die cut the white stamped piece, a piece of Pool Party and the layering scalloped out of the Silver Foil. Attach these 3 pieces together and add dimensionals to the bottom for a little lift. Attach it to the Shimmery White, add Pool Party ribbon and a piece of Silver Mini Sequin Trim and attach to the Pool Party base. Add a few clear rhinestones and you are finished. I know not your traditional Christmas colors but I think it works. I like to do something a little different from time to time.